This was my fourth and final week of the store cupboard challenge, with a bonus nine days taking it to the end of June. After last week’s extravagance I managed not to go overboard on food shopping, and we finally got the sunshine suitable for a barbecue when some friends came to stay for the weekend. The last days had a strange holiday feeling, as I focused on using up odds and ends, trying to create space in the fridge, freezer and cupboards. baked beans for me, and with leftover broccoli and cauliflower cheese for my husband. A day of eating up leftovers in a myriad of different forms. My Husband’s Packed Lunch: Sausage sandwich. I made a pie that combined leftover roast pork, apple sauce and gravy with the last of the pack of puff pastry, and can smugly say that it was really delicious. Glad I got the pie dish and funnel from the charity shop! Highly recommended. I finally faced up to the remains of a packet of brown lentils, which had lingered in the cupboard for more years than I care to remember. They were fine with some roasted veg and the Pizza Express Light Dressing bought from Approved Food ages ago, but I won’t be rushing to replace the lentils any time soon. 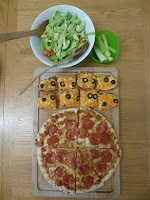 My daughter was invited round for tea after school, and my son ate his sausage rolls so fast there wasn’t time for a photo! The pasta started off as a way to use up tinned tomatoes and the last of some chorizo, but after a quick Google and the addition of peppers, tinned anchovies, capers and chilli flakes it became distinctly more interesting. 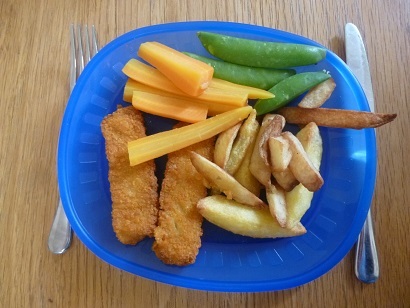 As you can see, I was quite keen on the roast pork sandwich and started eating it before remembering to take a photo… The children’s fishfingers and chips involved using up the end of one bag of oven chips topped up with some home fries bought on offer and unlikely to be repeated. I really liked the green thai chicken curry, using some of the big whole chicken frozen at the start, but the spring greens I used instead of pak choi were a bit overwhelming. chicken curry and brown rice for me. 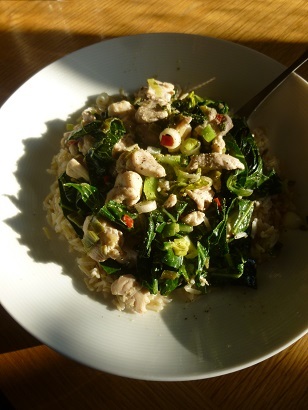 Somehow my husband couldn’t face leftover thai curry and brown rice for his packed lunch, so I had it instead of pizza during the family DVD viewing. almond puff pastry tart with ice cream and toffee sauce. With friends coming to stay, I decided to do pancakes on Saturday, rather than attempt a massive batch on Sunday morning. 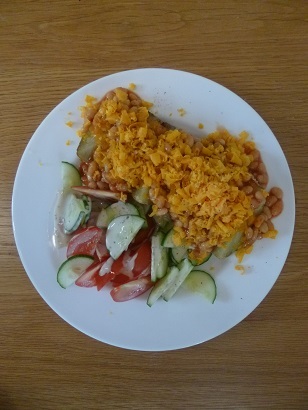 I headed off to help at the school fete with a hasty packed lunch involving an unphotographed tin of pilchards, some salad and a sandwich thin, and enjoyed the chance to indulge my inner librarian setting up the book stall. 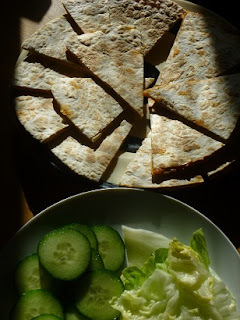 Everyone else got to eat a very easy lunch of pitta bread and taramasalata, and then we finally had enough sunshine for a barbecue that evening. I made some burgers plus sausages and frankfurters for any burger refuseniks. 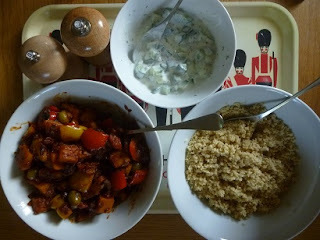 After 27 days I also plucked up the courage to use the giant cous cous from Approved Foods, as the base for a salad, and it tasted fine. The pear and almond tart was fun to make and received with great enthusiasm, especially when served with large quantities of ice cream and toffee sauce. cucumber, carrot sticks and lettuce. Strawberries. leaves soup for my husband, falafel salad pitta for me. We cracked open a yellow-stickered can of Jus Rol “bake your own” croissants. The tin was fun, but the croissants were less sucessful. Maybe not one to repeat. Luckily we had some normal ones as well. I didn’t get round to taking many photos with weekend visitors, but at lunch time the gammon went down well with waldorf salad. I tried making seasame seed coated falafels, which took ages, but the end result didn’t really justify the faff. 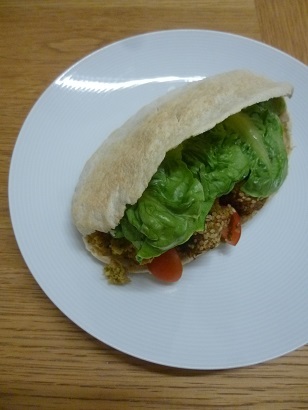 I finished off the leftover falafel in a pitta that evening. 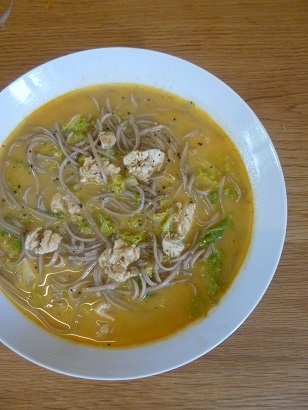 It took until right at the end of the challenge, but I broached the soba noodles that had been hanging around for years, in a strange Asian fusion effort at chicken laksa noodle soup, coupled with more of the enormous chicken, some tinned coconut milk, a sachet of laksa spice paste bought in Chinatown, and some leftover chinese leaf. The spices definitely livened up my lunch time. In the evening we ate a butternut squash tagine adapted from “Economy Gastronomy”, in that I used a lot less squash, and substituted raisins for dates rather than invest in further dried fruit. with cucumber, raw sugar snap peas and lettuce. New Zealand biscuits. 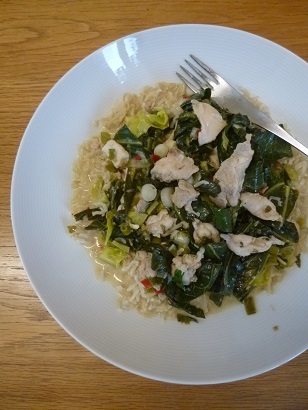 On the last day of my June store cupboard challenge I was on a mission to use up whatever I could – from defrosted raspberries on my porridge, to making New Zealand biscuits to chip away at the mountain of cheap oats. I think it’s safe to say that without the store cupboard challenge I would not have used the remaining pilchards, the last spring onions and the leftover half of a jacket potato to make fishcakes, nor would I have served them on wilted spring greens. They were fine. Rather more successful were the chicken burgers for the children, using the very last tiny pieces of the enormous chicken, and the remnants of the cooking bacon turned into quiche. mention it on specific days.